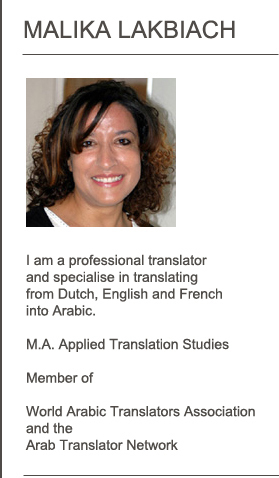 We are a select team of highly qualified translators specialising in Arabic, Dutch, English and French with many years' experience in mainly Law and Education. As native speakers with relevant qualifications, we have an excellent command of both the target as well as the source languages. Also, having lived and worked in various countries, we have gained a profound understanding of the relevant societies and their cultures. This enables us to work around possible differences and adapt any content to suit your target audience. We guarantee our clients accurate and outstanding quality translations that contribute to the success of their business. Throughout the translation process you are assigned a Project Manager who works closely with you to ensure that your requirements are met. Following delivery of the translation, the communication lines remain open to guarantee that you are completely satisfied with the end result. We practice the highest degree of integrity towards our clients and take meticulous care of every single aspect of their projects. Before sending the final version of the translation, it is thoroughly proofread and quality checked at no additional charge. Our services save you the time and the cost spent on correcting lower quality translations. Whether you require translation of short text passages or large-scale projects, Focused Translation IS your first choice.